The next two mornings – September 5 and 6, 2018 – you can see see the moon near the two brightest stars of the constellation Gemini the Twins. They’re called Castor and Pollux, and they’re good stars to come to know. See how bright they are, and how close together? Even without the moon, they’re noticeable on the sky’s dome. 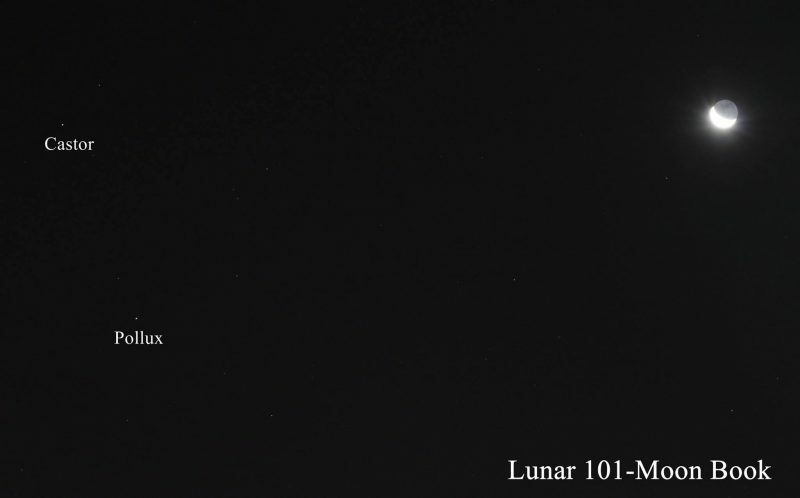 The moon, Castor and Pollux on the morning of September 5, 2018 from our friend Lunar 101 Moon Book. Watch for ’em Thursday morning, too! Gemini is the constellation of the Twins, and Castor and Pollux are often called “twin” stars. But these two stars aren’t twins; they’re really very different. Although Castor and Pollux appear close, they’re not physically related or close together in space. Pollux, the closer star, lies about 34 light-years away, while Castor resides at a distance of about 52 light-years. 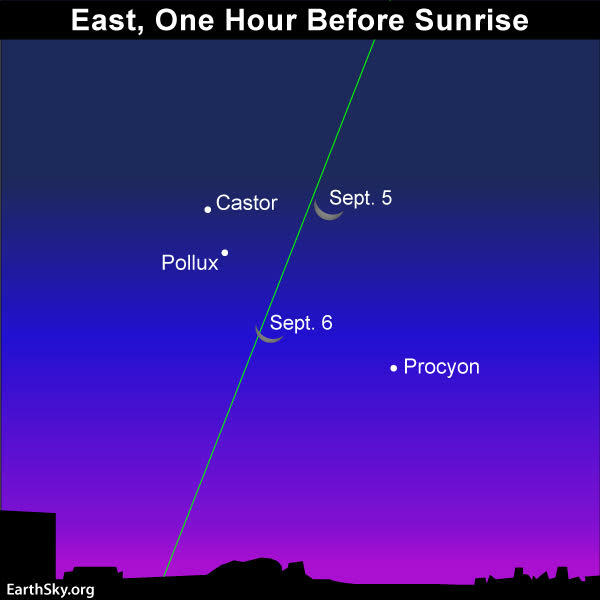 If you scrutinize Castor and Pollux, you might discern their difference in color. Castor appears white in contrast to the orange glow of Pollux. A white star is a relatively hot star in the heyday of youth. An orange star is a cool star in the autumn of its years. Moreover, Pollux’s orange color reveals that it’s a giant star. 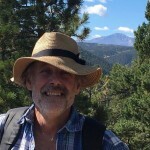 According to the star expert Jim Kaler, any star with the mass of 0.8 to 5 times solar swells up and becomes a giant star in old age. 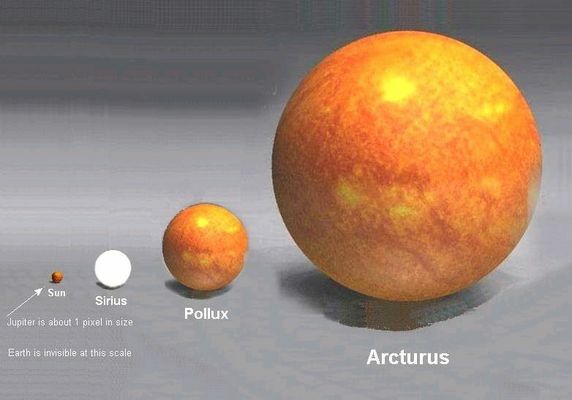 Pollux, the nearest giant star to Earth, has a diameter of about 10 of our suns. It’s also one of the very few giant stars known to harbor a planet. You can see the comparative size of the star Pollux and our sun in this image, as well as some other stars. The other “twin,” Castor, is remarkable in its own right. Castor is actually six stars in one, consisting of 3 pairs of binary stars, all revolving around a common center of mass. By the way, the moon will move out of the constellation Gemini and into the faint constellation Cancer the Crab on or near September 7, 2018. Then, on September 9, we’ll have a new moon, with the moon transitioning out of the morning sky and into the evening sky. 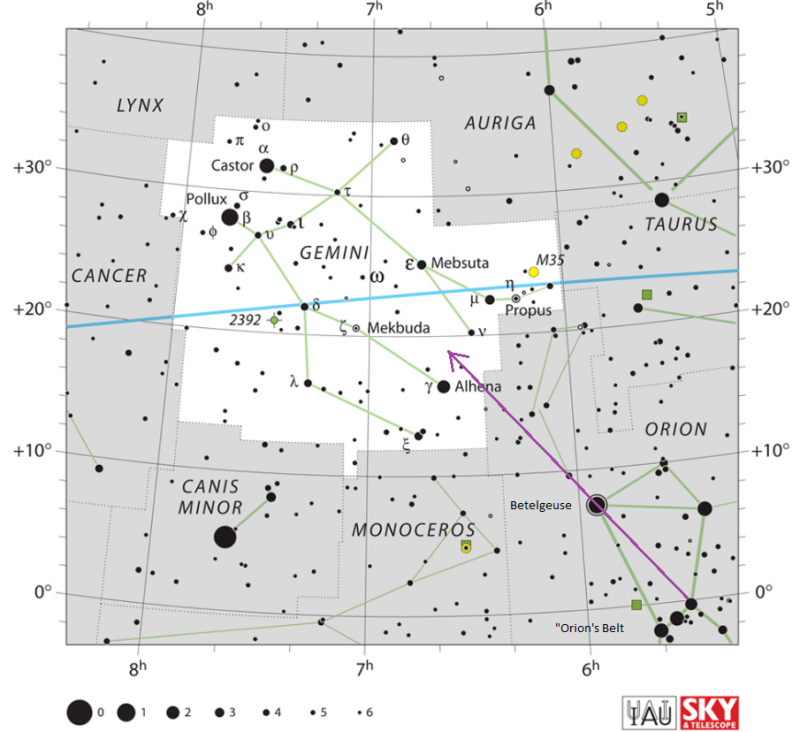 Sky chart of the constellation Gemini via IAU. Draw an imaginary line from the easternmost star of Orion’s Belt and through the bright ruddy star Betelgeuse to locate the Gemini stars, Castor and Pollux. Click here to learn more about Orion..
Bottom line: On September 5 and 6, 2018, use the waning crescent moon to find the Gemini stars, Castor and Pollux.